We #giveascot about the heroes that create our incredible work culture. In our Team Showcase series, we’re interested in digging that wee bit deeper to unveil the idiosyncrasies that make the TwoScots vanguard unique. Today we’re sitting down with freshly minted team member, Dominic Brightmore, who only joined us in November last year. Two months into his role as a Senior Consultant in our Executive Finance Division, we wanted to touch base with the hilariously charismatic Dom to recap his time on board. Lucky for us, he loves a chat. Dom landed his position with us after having garnered an impressive stint in Finance Recruitment in Manchester, UK. He was met with the opportunity to take 3 months off work, prompting a mini round-the-world trip. “I came back to the UK and the weather was truly awful. It was basically a deep freeze. Manchester was -7 degrees at the time. My Aunty got me a book for Christmas about moving to Australia, so I read about 4 pages and decided to take the leap!”, Dom recounts. Having always felt drawn to Melbourne, Dom connected with recruiters Down Under, who then pointed him in the direction of TwoScots. Within a matter of two days, he recalls feeling instantaneously part of our family. He remembers a sense of inclusion and support, admitting to having an “immediate connection with the team”. When aiming to inspire growth for our employees, we see the greatest successes come to fruition when the TwoScots values reflect and align with the values of our team members. We know how crucial it is to build individual growth as a consultant through creating a fast-paced, fun and contagious work environment. Dom notes that “TwoScots is all about empowering your personality,” through those feel-good office vibes. “TwoScots has essentially exceeded my expectations of what I was hoping for in company culture. It’s less about the ‘sell, sell, sell’, and more about bringing your personality to the table rather than being a carbon copy of every other recruiter out there. This means you can connect with people on a human level and it doesn’t matter if it’s a client or a candidate, people appreciate that we genuinely care and try to get under the skin of what makes them tick,” he says. Dominic’s typical day involves forging long-lasting connections with key clients here in Melbourne whilst maintaining a diverse matrix of senior candidates. 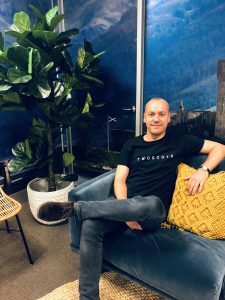 The connections Dom has made within a short timeframe at TwoScots have already extended outside of office hours over his first sun-soaked Melbourne summer. Testament to the camaraderie and ‘arms wide open’ approach our crew adopts, Dom was humbled to have spent his “first hot Christmas Day” with two of the girls from the team at Sandringham Beach for a bona fide, Aussie BBQ. “They invited me, knowing I wouldn’t have anything to really do for Christmas this year, which was really nice,” he tells us. An ardent advocate for “networking, networking, networking,” it’s no surprise that Dominic touts our Saroo Brierley Networking Event in November 2018 as a standout moment so far. “In my whole career, that was the BIGGEST networking event I’ve ever attended. I was impressed…it really highlighted that a very large group of clients were willing to support and be part of the TwoScots journey,” Dom says. We’re keen to see what 2019 has in store for Dominic, and are rapt to hear his personal goals for the year are in motion. We’re thrilled to have Dom in our Executive Finance team, and know that his brilliant beginnings are paving the way for big things ahead. Stay tuned for more chats with the remarkable individuals that make our office a buzzing hive of passion, laughter and goal-kicking.